The Blue Team at Oswego County BOCES Stepping Stones Day Program studied igloo construction recently using the flipped classroom model. 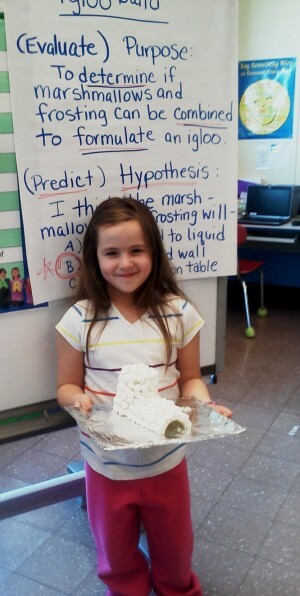 Exceptional education student Madisyn Stuper shows off her finished igloo made of marshmallows. The flipped classroom model inverts traditional teaching methods, giving students ownership of their learning. Educational technology and activity learning are two key components of the model. 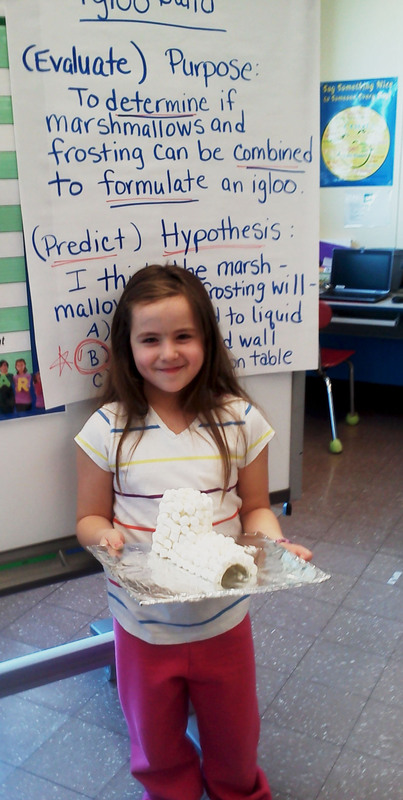 Students in Robyn Yorker’s class watched instructional videos depicting the building of igloos and were then asked to locate and view videos that demonstrated the building of igloo replicas. Following this research, students created material lists on white boards for their igloo builds, considered building issues and drew their designs on paper. The project based learning experience highlighted the shift from teaching to learning as students applied their knowledge of igloo building to the actual construction of their own unique igloo structures.